Philocrites: Boston Globe blogs Deval Patrick's interfaith service. 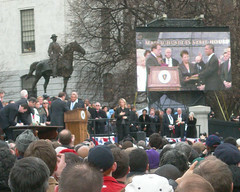 Boston Globe blogs Deval Patrick's interfaith service. Here's the Globe 's complete coverage of the inauguration, with Patrick's inspiring inaugural speech and a bunch of photo slideshows. (My photos are at Flickr.) Paulson reports that Peter Gomes's sermon in the interfaith prayer service pointedly congratulated Patrick for his support of gay marriage. Meanwhile, at UUA.org, Deb Weiner reports on UUA President Bill Sinkford's part in Patrick's interfaith service. Previous: This week at uuworld.org: Stick your neck out. Next: UUA Board meets in Boston January 19-21. Don't know if you saw this, but Peter Berger, Professor Emeritus of Religion, Sociology and Theology, Boston University dissed UUs at a recent Pew Forum event. "Some of my best friends are Unitarians in Boston. I like them in many ways, but they represent absolutely nothing. Well, my favorite Unitarian joke, which was told to me by a Unitarian minister in Boston is: What's the beginning of the Unitarian version of the Lord's Prayer? To whom it may concern. (Laughter.) There is a market niche for Unitarianism for people who define themselves as seekers, OK? So the seekers get together and seek. But it's not a very promising position, with whatever openness or doubt or hesitation. Unless a religious community has something to affirm, it has no raison d'être." Thanks, Jason! Berger has made this criticism before, although his target is often theological liberalism generally. I think it's a particular temptation of highly intellectual people to confuse doctrinal thoroughness for personally satisfying religion, and yet a historian or sociologist of religion ought to be able to recognize that some religions do "work" even when individual scholars find themselves baffled by the intellectual vagaries involved. Berger finds Unitarian Universalism unsatisfying, whereas I find dogmatic religions unsatisfying, intellectually and spiritually. C'est la vie! In the final volume of his trilogy on the history of American liberal theology, Gary Dorrien discusses Berger's participation in the 1974-75 Hartford Appeal, which "accused modern theologians of purveying humanistic and reductionist views about God, Christ, salvation, and the church," Dorrien writes. Most of the signers were conservatives like Richard John Neuhaus, but Berger and William Sloan Coffin Jr were the two "token liberals," Dorrien says. See pages 517-523 for Dorrien's discussion of Berger's criticism. The service began with a series of prayers led by a Native American chief, Vernon "Silent Drum" Lopez, wearing a feather headdress and an ornate beige and fuschia tasselled garment. Lopez led the entire congregation -- including the clergy -- in turning to face each direction of the compass, as Lopez read a series of prayers. The clergy included full cross-section of Christian, Jewish, and Muslim leaders, among others. I was there, and took great personal satisfaction in seeing people like Cardinal Sean O'Malley being led in a pagan ritual by a Wampanoag elder. It's my strong impression that ceremonies like the one above are inauthentic inventions. Although not necessarily exploitative, they are done either to entertain the white folks or to give Wampanoag kids a sense of what their cultural heritage (most of which has been irretrievable lost) might have been like, and not done either to carry on an authentic living religion or revive an authentic dead one. Most of the Gay Head Wampanoags for a century or more were Baptists, and the only house of worship in town has always been Baptist. These days, they're still mostly Baptists, or secular, except for those who have become Catholics after intermarrying with Cape Verdean or Portuguese families. My partner's grandfather dispensed folk wisdom and folk cures to his extended family, but mostly he appeared on postcards staring mystically over the Gay Head Cliffs at sunrise dressed in Kit Carson buckskins and a Sioux headdress, and operated a tourist shop that sold bamboo peace pipes and rubber tomahawks. Today, the white man (or perhaps I should say "dominant culture", since it now includes the nonwhite Governor Patrick, and hooray for that, it's been too long in coming) may have a less blunt apprehension of Native spirituality, but was Mr. Lopez's performance really any more authentic? The burning question to me is whether authenticity and validity need to be connected. I think they do. What Fausto said, also, I think many people would be shocked to discover what a tiny percentage of Native Americans still hold onto some vestige of pre-Christian religion. It is very likely that the elder at that ceremony considers himself a good Christian. "Very likely", indeed. After all, his name is Lopez, not Tisquantum or Hobbamock. It wouldn't surprise me if he even asked and received permission from Cardinal O'Malley in advance.